Take a tour of the store in this video. 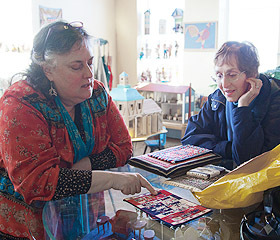 Museum curator Lori Kagan-Moore is on-hand for consultation in the Miniatures Store. 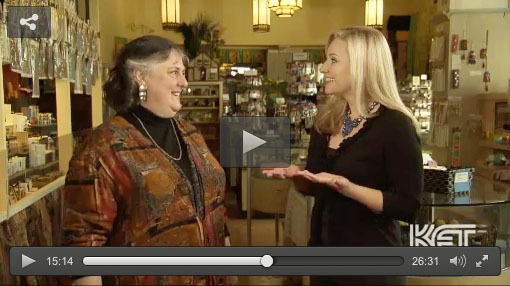 Kentucky Educational Television did a video about Kentucky Collectibles. Our section is at the 15 minute point. There is never a charge for a visit to the Miniatures Store, which is located in the spacious lobby of the Museum. The shop is fully stocked with a marvelous selection of furniture, accessories, fixtures, and building components in all price ranges. 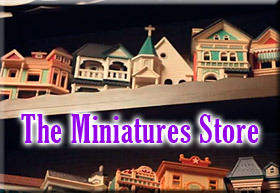 From four packed bargain shelves where miniature furniture is under $5, to the finer signed artisan pieces, the miniatures shop has something to fit every dollhouse need. The museum is dedicated to providing great service and personal attention to our walk-in clientele; we are sorry, but we don’t do any online sales. Miniatures Store hours are the same as Museum hours. We accept Visa, Mastercard & Discover, both credit and debit. Click here for special scout programs.